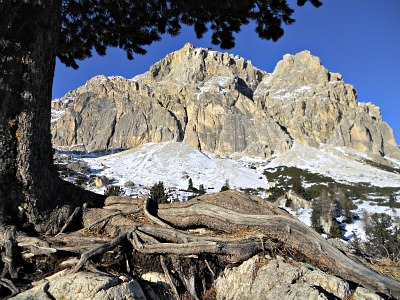 Lagazuoi, the "Mountain of the War", in the Silence of the Dolomites, Two Steps Away from Cortina. The Lagazuoi (2,835 m; Lagazuoi-Berg in German) is a mountain belonging to the Fanis Group; from a strictly geographical standpoint, it is part of the eastern Dolomites of the Val Badia/Gadertal, even though it is more often associated with the Ampezzo Dolomites because of its proximity to Cortina, and also for its being inextricably linked with it from an historical point of view – especially in respect to WW1 events. Despite the very close proximity to the border with South Tyrol, from an administrative point of view the mountain belongs entirely to the Veneto, and it is divided between the territories of the municipalities of Cortina d'Ampezzo to the east and Livinallongo del Col di Lana in the west (in the image above, the Lagazuoi as it is seen from the other side of the Falzarego Pass, by the Rifugio Cinque Torri – for which see Cinque Torri). 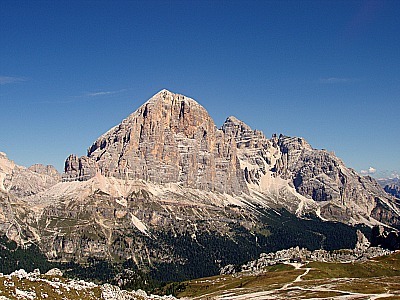 The Lagazuoi is formed in reality of two clearly distinct reliefs, respectively called Piccolo Lagazuoi (Kleinen Lagazuoi, 2,778 m) and Grande Lagazuoi (Großen Lagazuoi, 2,835 m), standing behind it. The massif is delimited to the south by the Passo Falzarego (2,105 m), to the west by the Passo Valparola (2,192 m), to the north by the Alpe di Fanis and the Val Travenanzes and to the east, finally, are the complex of Cima Falzarego-Col dei Bos and the Tofane massif, which separate the range from the underlying Conca di Ampezzo (Cortina basin). 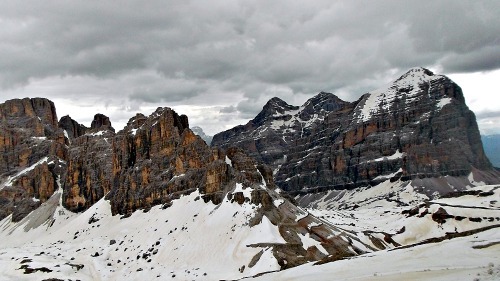 In fact, as a note of peculiarity, the Lagazuoi is the only mountain considered part of the Ampezzo Dolomites not to be visible from the 'conca' itself, being concealed by the imposing bulk of the Tofana di Rozes; to be more precise, however, the Lagazuoi can be seen from the basin’s southernmost fringes – namely from the hamlets of Zuèl and Acquabona, also belonging to Cortina (see below a picture of the mountain taken from the underlying cable car station). In the vicinity of the massif one can find the small Lagaciò lake, or Lago di Lagazuoi, – a perennial expanse of water fed by subterranean springs. Situated under the Forcella del Lago – to which it gives its name – and along the valley that leads to Armentarola, the Lagaciò lake is reachable by walking the ridge of the Lagazuoi from the cable car station at the summit, along old military tracks (in the image below, a general view of the area by the Rifugio Lagazuoi, described later). During the course of WW1, between 1915 and 1917, the Lagazuoi was the backdrop of harsh fights between the Italian and Austro-Hungarian troops, both of which dug a complex network of tunnels and galleries into the rock of the Piccolo Lagazuoi, and attempted at the respective positions through the explosion of mines. In October 1915 the Italian Alpine regiment occupied some positions on the southern flank of the Piccolo Lagazuoi, amongst which was a narrow ledge then become infamously known as Cengia Martini, which crosses the rock wall from west to east and was strategically important, while the Austro-Hungarian positions were located at the summit of the mountain itself. In order to chase the adversaries from their position – fortified and dug into the rock – the Austrians exploded three mines, the most potent of which in 1917 blew off part of a rock wall almost 200 metres high; in spite of that, the Italian positions on the Martini ledge were not abandoned. In turn, the Italians dug a new gallery covering 200 metres in height inside the belly of the mountain, up to the ‘anticima’ (foresummit) of the Piccolo Lagazuoi; the crater generated by this huge explosion is still visible. After the defeat at Caporetto later in 1917, the Italians withdrew from their positions, and all military operations in the area drew to a close, after many consuming months spent in the high snow. The massif is crowned by an important cable car (see image above) that connects the Passo Falzarego with the Rifugio (read below), on the Piccolo Lagazuoi (2,752 m). 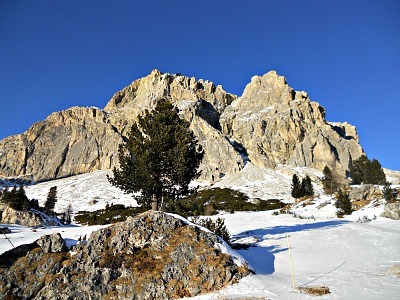 From there, numerous paths and mule-tracks depart in various directions and most of them are carefully signposted by the CAI (Italian Alpine Club); many take westwards to the Val Badia/Gadertal, northwards to the Val Travenanzes and the Val di Fanes and eastwards to the Col dei Bos and the Tofane group (pictured above, the Tofana di Ròzes, as it appears within the Dolomite scenario that opens up on the high plateau of Lagazuoi). 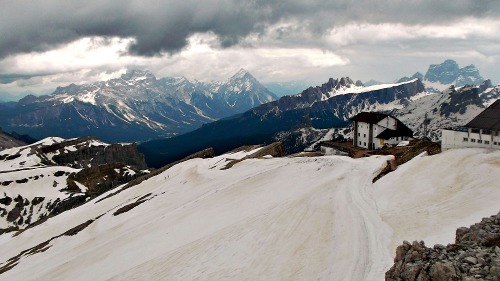 The Rifugio Lagazuoi (2,752 m) is one of the most elevated mountain inns in the Dolomites. Its spacious deck is famous for the breathtaking views it offers on the peaks at the heart of the region, now part of the Dolomites UNESCO World Heritage Site. The Rifugio is nestled near the summit of Mt. Lagazuoi (2.835 m) above Passo Falzarego, half way between Cortina and the Val Badia/Gadertal, straddling also the territories of two Natural Parks; namely, the Fanes-Sennes-Braies in South Tyrol and the Ampezzo Dolomites Regional Park. The hut can easily be reached by hiking or directly with the Lagazuoi cable car. It is an excellent starting point to visit the restored galleries, trenches and emplacements of the First World War Open Museum and to ski along the famous Armentarola – the longest and most spectacular ski slope of the Dolomites; it is also connected to all the other main slopes of Cortina and the Alta Badia ski areas. 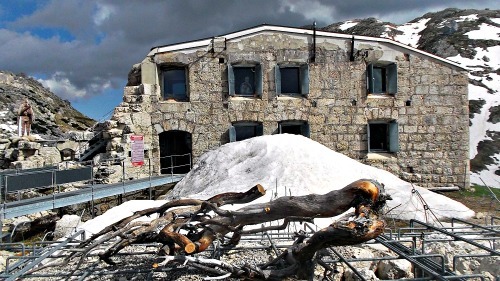 The Lagazuoi mountain hut offers accommodation, bar and restaurant service with local specialities like polenta with roe deer or the typical strudel. Recently restored, the galleries and the Italian and Austrian trenches of WW1 are now open to the public and can be visited freely as part of the Open-air War Museum ('Museo all'Aperto della Grande Guerra'), which offers a notable attraction of undoubted high historical and naturalistic value. The building of the Museum is situated near the Valparola Pass; it is hosted inside the ancient fort known as "Forte Tre Sassi", of which you can see an image below. The area around Passo Falzarego constitutes a location of great value for botanic interest and vegetation – so much so that it has been classified as 'biotope'. This fact is determined – in the first instance – by the characteristics of the soil, whose matrix can be ascribed to the Raibl Formation or to a marl-sandstone structure, which is easily subject to erosive processes and it is also affected by surface running water that contributes to the deposit of peat layers, in correspondence with hollows on the ground or accumulated by the modest terracing. This area is very articulated from the point of view of the vegetation; in particular, one can observe the following habitats: shrubs (particularly important are the remaining patches of Rhododendron); pastures and meadows, noteworthy for their landscape relevance but also for their floral and ecologic aspects, with extensive populations of Lady's Mantle (Alchemilla) which are of particular interest, located mostly in the area of the Falzarego Pass and by the lifts at Col Gallina. Peat bogs and humid slopes by the Passo Falzarego are known to host several important humid biotopes, some of which have been discovered only quite recently; from a botanic point of view, some stations of Juncus arcticus have also been identified here not long ago. Around the whole area situated by the ski-lifts at Passo Falzarego – and on the Cinque Torri-Nuvolau slopes – there are the extensive sub-hygrophyle populations of Lady's Mantle (Alchemilla) mentioned earlier; these habitats occupy wide expanses not only in the flatter sections but also along the slopes. Important too are the primitive habitats composed of rocks and rock layers: these detritus (mainly scree and rock deposits) express the classic Dolomite succession, with a tendency to evolve – wherever the disaggregation processes that act on the rocks lessen – towards more primitive Firmetum and Seslerietum plant associations. Particularly noteworthy is the Elinetum – a plant association dominated by the soft tufts of Elyna myosuroides, a grass belonging to the Graminaceae family – while small depressions and nival valleys (that is, where the snow lingers longer) are dominated by Dwarf Willow formations. In terms of woodland habitats, the forest component here is mostly ascribable to two fundamental types: Sub-alpine woodland with Norway spruce (Picea abies; a little more than 10%) and a mixed formation with larch and Arolla pine (Pinus cembra; almost 30%) – a species which is present also with some majestic, multi-centenary specimens. These mature formations (climax) are particularly rich in primary, valuable ecologic information. Between the two woodland formations just mentioned, the most characteristic – covering the sub-alpine vegetation zone between 1,700 and 2,100 metres – is by far the mixed association between Larch (Larix decidua) and Arolla pine (Pinus cembra), usually sparse and full of light, and interspersed with pasture lands. There are also – scattered here and there – very ancient and twisted, monumental specimens of Pinus cembra (such as the one pictured below, found by the lower station of the Lagazuoi cable car). Particularly interesting in this area are also the Willow formations; the species identified here are quite numerous; some of them are also included in the Red List. These comprise Salix mielichhoferi, S. waldsteiniana, S. caesia, S. foetida, S. hastata, S. glaucosericea, S. nigricans and S. appendiculata, which are only some of the species that can be seen here – without considering the dwarf ‘espalier’ willows of the Salicetum retuso-reticulatae association. Many shrubs are to be found in the understory – especially the two types of dwarf Alpine Rhododendrons (both commonly known as 'Alpenrose'), Rhododendron ferrugineum and R. hirsutum. Important are also the herbaceous formations in which live side by side species belonging to different Alpine plant associations (also in habitats protected at European level): found here are representatives from the Seslerietum, Caricion firmae and the Nardetum; alkaline peat bogs ascribable to the Caricion davallianae; acid peat bogs related to the Caricion fuscae; plant consortiums with hygrophile ‘tall herbs’ and also more modest patches of bryophytes found by small springs (Cratoneurion). 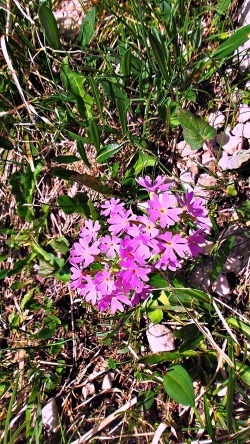 Within all these formations there are numerous rare species, amongst which are to be mentioned the Wild Arctic Rush (Juncus arcticus), the orchid Dactylorhiza cruenta, the willows Salix foetida and S. glaucosericea, plus other plants such as Epilobium nutans and Carex dioica (pictured below, a beautiful blossom of Bird's-eye Primrose, Primula farinosa, typical of peat bogs and humid slopes). On the driest fields and meadows, once regularly scythed (the toponym Falzarego is not by chance, as it comes from the Italian word 'falciare': 'to scythe'), can also be found some other noteworthy or even rare species, such as Alpine Milkvetch (Astragalus alpinus) and Scented Vanilla Orchid (Nigritella rubra). In some areas, sub-hygrophile associations can also become established, with various species belonging to the genus Alchemilla, decidedly prevailing. At the ecologic level, these conditions are ascribable to those in which Green Alder (Alnus viridis) formations dominate. In terms of fauna, the Golden Eagle (Aquila chrysaetos) is certainly the most notable (and noble) presence here. This majestic 'king of birds' is the typical predator of high altitude meadows; amongst its preferred preys are marmots, which abound in open pastures and meadows. The Golden Eagle has strongly pointed claws that allow it not just to grasp its prey but also to push it, making it lose its balance and eventually fall (it is a sophisticated hunting technique). Eagles' nests are usually located in clefts in the rock, normally at lower altitudes in comparison to their hunting ground: this allows them to glide while holding their prey, thus harnessing the force of gravity.